Within New York City’s Metropolitan Museum of Art, the sphinx of the Pharaoh Hatshepsut holds court. How did this ancient artifact get to the museum? 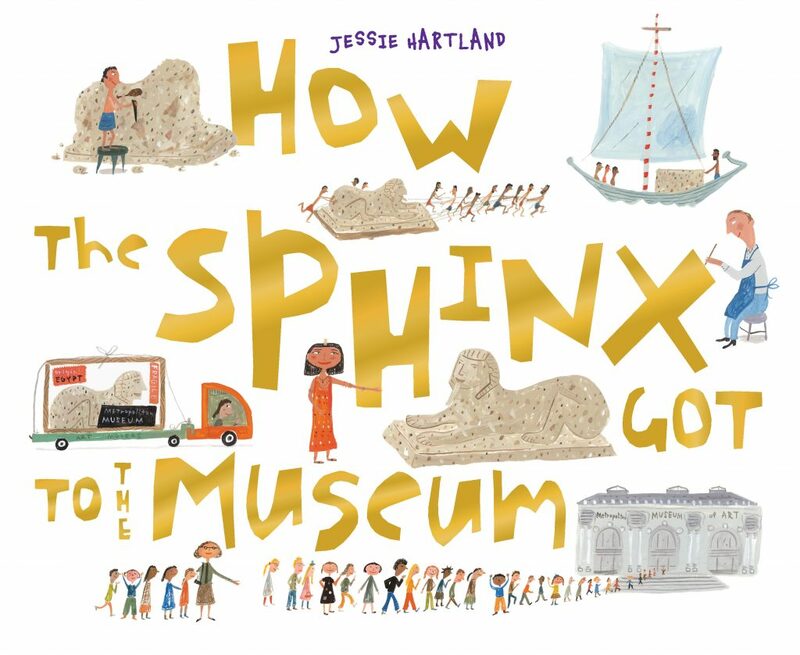 Acclaimed author and illustrator Jessie Hartland beautifully presents this informative and fascinating history of the Hatshepsut sphinx: from its carving in ancient Egypt to its arrival in the hallowed halls of this world-famous museum. ★ Lively artwork and rhythmic text highlight this unique picture book that tells the story of how one particular piece of Egyptian sculpture ended up in the Metropolitan Museum of Art in New York City. Hartland begins with a brief description of Hatshepsut and her significance as a female pharaoh in ancient Egypt, as well as explaining how most pharaohs had many pieces of statuary created in their honor. The story continues to build as Hatshepsut orders the creation of the sphinx, the sculptor secures the granite, the priests admire it, the stepson destroys it, and then the real fun begins after an archaeologist discovers it 3000 years later in a pit and begins the process of acquisition for the museum. The cadenced writing is simultaneously predictable and unexpected, making it a joy to read aloud, inviting listeners to join in. It also includes vocabulary such as curator, rigger, and registrar, providing the opportunity to delve into discussions of unusual career choices, as well as fun verb choices that will intrigue children. The accompanying illustrations are animated and detailed, from an archaeologist's tools to a curator's cluttered office—plenty for young eyes to discover and share. Brilliantly simple and effective, this is an excellent addition to any elementary collection. ★ At some point every visitor to a museum wonders the same thing: How did that get here? With exhaustive, dizzying, yet crystal clear detail, Hartland answers that question in regard to a seven-ton sphinx from ancient Egypt. The opening illustration introduces a museum docent and a gaggle of curious students, but then we backtrack to the reign of Pharaoh Hatshepsut, who requests from a sculptor six granite sphinxes. Priests observe the finished works; years later, Pharaoh Thutmose III destroys them; 3,000 years later, an archaeologist discovers the ruins. This is just the beginning—before it’s over we’ll meet art movers, curators, conservators, riggers, registrars, retouchers, and more, and the increasing lineup is featured on each right-hand page in “house-that-Jack-built” stair-steps: “The SPHINX that was documented by the PHOTOGRAPHER, painted and restored by the ARTIST, officially numbered by the REGISTRAR,” and so on. Eye-openers abound (the movers, for example, avoid “bumpy roads and tight turns”); while Hartland’s cheery, childlike paintings effortlessly shift from desert to city to museum. Closing historical notes are also great. The overall elicited emotion is awe—both for the passage of time and for the steps required to bring a simple hunk of stone to the fifteenth person: you.